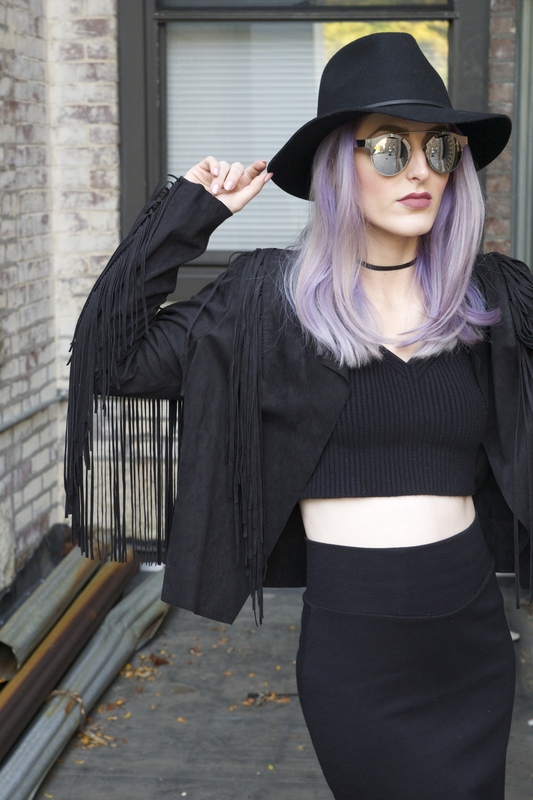 Faux suede fringe jacket courtesy of Primark, Brixton hat, Spitfire ‘Intergalactic’ sunglasses. See Sam stun in a Rag & Bone skull sweater and Stuart Weitzman boots. 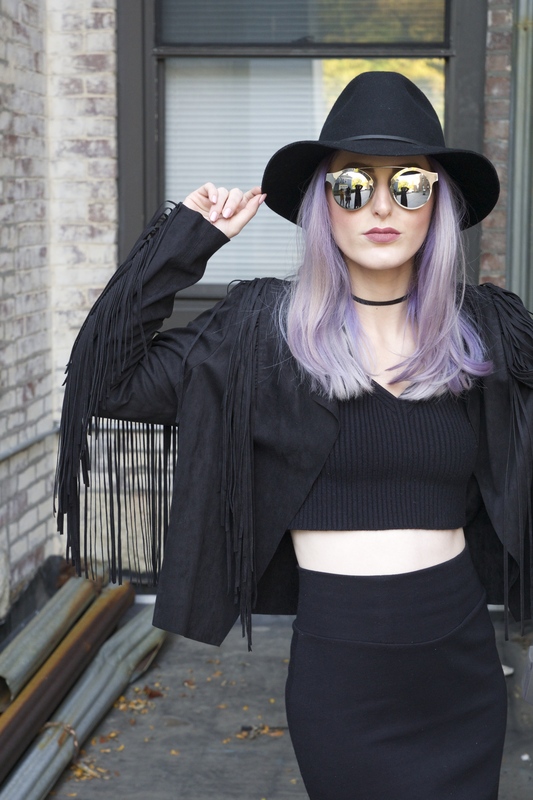 Kayte’s rocking an amazing combination of pieces from Free People and Forever 21. October is definitely my favorite month of the year. Between the beautiful foliage, temperatures that allow layering but don’t leave you shivering, and the celebration of all things scary that DO make you shiver, I really couldn’t ask for more. 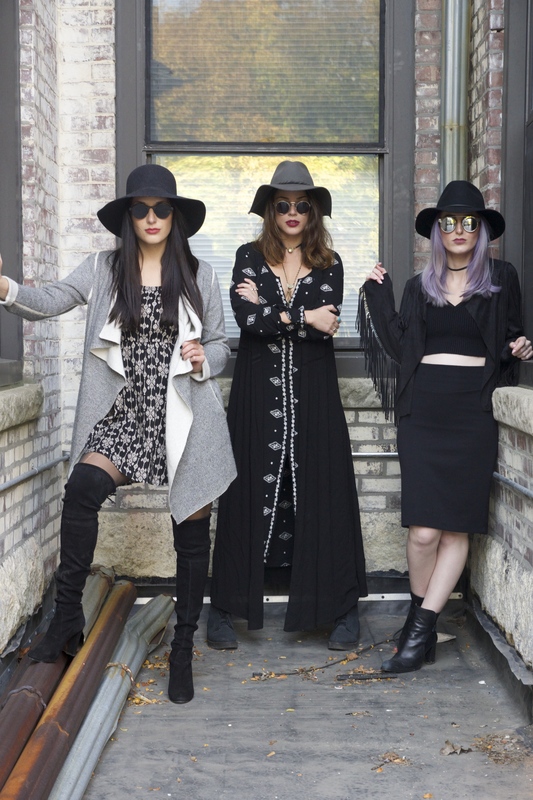 If you follow the Sauce, you’re well aware that I actively look forward to (and plan for) Halloween starting on November 1st, and that my personal style is inspired by famous spell-casting squads, such as the ladies in American Horror Story: Coven, and The Craft, all-year-round. 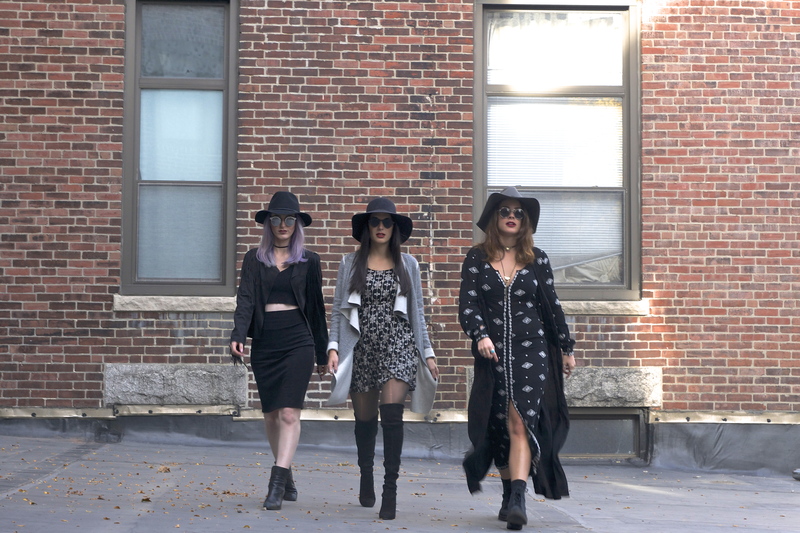 So of course I lunged at the opportunity to do a witchy-themed shoot with two of my favorite fellow Boston bloggers, Kayte of Mass Musings, and Sam of Fenway Fashionista. As three New England-bred, Boston-based babes, we can attest to the fact that there is no greater place on Earth to experience the spirit of Halloween than the state in which the most famous alleged witches lived, were taken to trial, and casually burned or hanged to death. This delightfully creepy chapter of the Bay State’s history gave us the beloved Halloween flick Hocus Pocus, and let’s get real about squad goals—what girl didn’t want to be a Sanderson Sister at some point (specifically Sarah Jessica Parker)? Who reading this post wouldn’t have loved to do the honors of lighting the Black Flame Candle, even though it is quite literally virgin territory? OK, I know, I know. I did it again: I disappeared for almost a month. I’m a bad, bad blogger! Or just consistently fashionably late, depending on how you look at things. But I hope this year’s Halloween costume will make up for my online absences. (I’m also sorry I didn’t post pictures of my costume sooner, but I can’t have been the only person who spent yesterday nursing a hangover…) I seriously do have lots of cool projects and collaborations in the works, so I appreciate your patience. Anyone who’s known me for at least twenty minutes knows that Halloween is my favorite holiday. 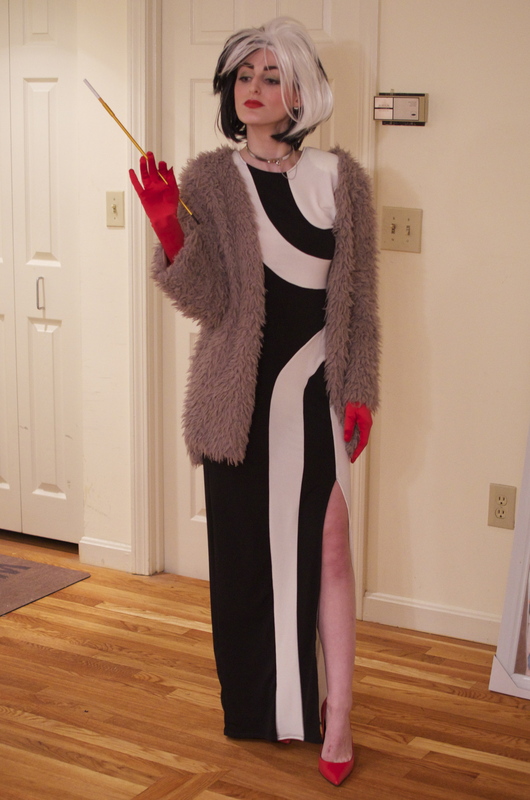 It gives fashion lovers a special chance to get really creative, and while so many girls like to play princess, this year I decided I should honor a villain on the one night we openly celebrate sin. 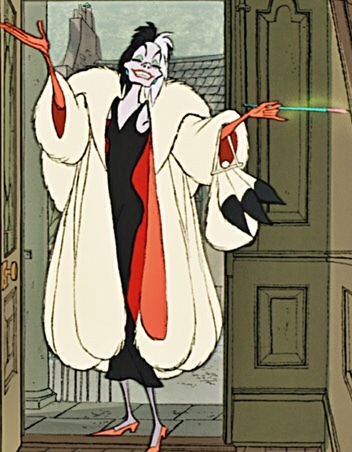 I chose Cruella de Vil because she’s not just an iconic female villain, she’s also a fashion icon, determined to commit a heinous crime in order to achieve a fabulous style statement. 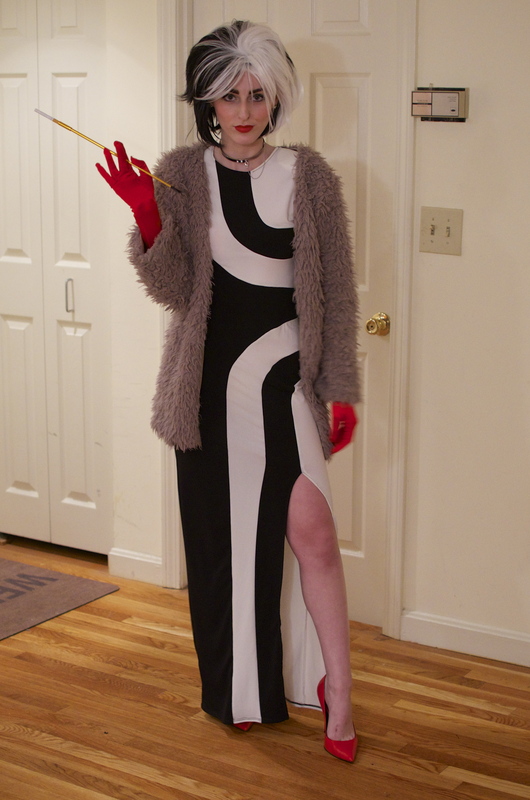 Whenever I put together a costume, I try to use as much as possible from my own wardrobe. This year, it started with a dress that had been sitting in my closet gathering dust and making me feel guilty for over a year. I bought the black and white maxi dress, complete with shoulder pads and a dramatic slit, on a whim at one of LF’s infamous sales. Obviously it didn’t cost much, but I got home and thought to myself, Where did I think I would wear this? My prom years are far behind me, and my calendar isn’t exactly marked up with galas. 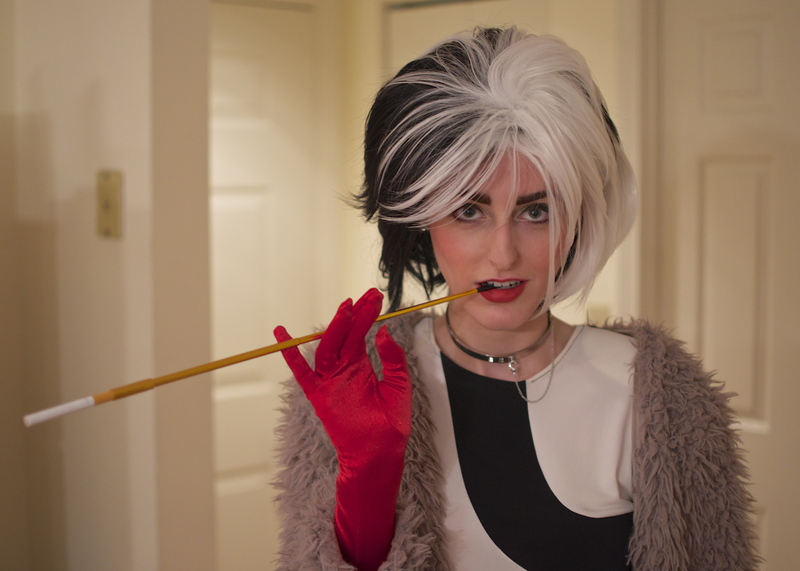 But when I saw it hanging next to my shag coat, an LF purchase that I’ve worn constantly for three winters, my Cruella vision suddenly became clear, and the rest just fell together. I’m obsessed with Eddie Borgo’s odd yet simultaneously minimalist jewelry, and this choker was on my wish list for months before I made it mine. The fact that the sleek, glamorous necklace happens to somewhat resemble a dog collar was an ever-s0-appropriate coincidence. 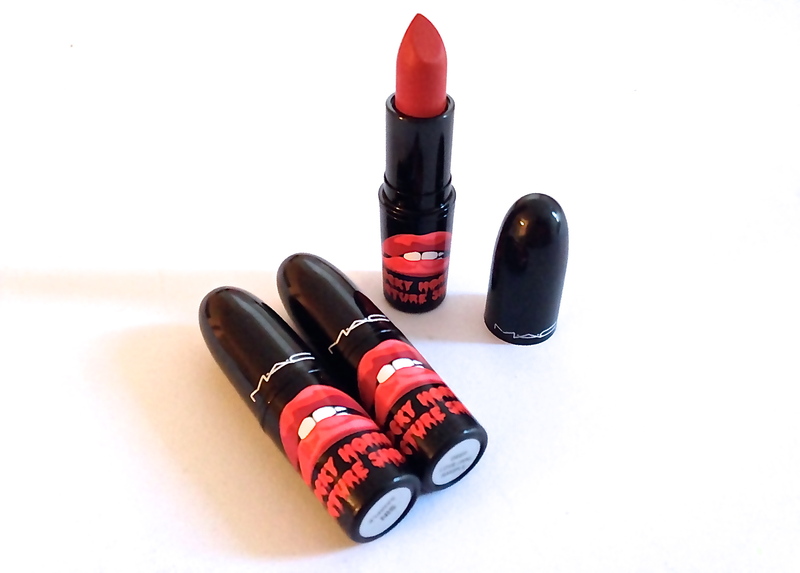 For Cruella’s signature red lip, MAC Cosmetics made my Halloween dreams come true with their Rocky Horror Picture Show collection. Rocky Horror is a Halloween cult classic film, and one of my personal favorites. Like so many MAC lipsticks, the Rocky Horror reds are smooth, rich, and flawless—and totally sold out. Special shout out to a special friend who helped me get my hands on these coveted colors! The finishing touches for almost any Halloween costume are easy to get online. eBay and the Party City website have all the Halloween essentials, and even the more unusual accessories, as long as you don’t wait until the last minute. 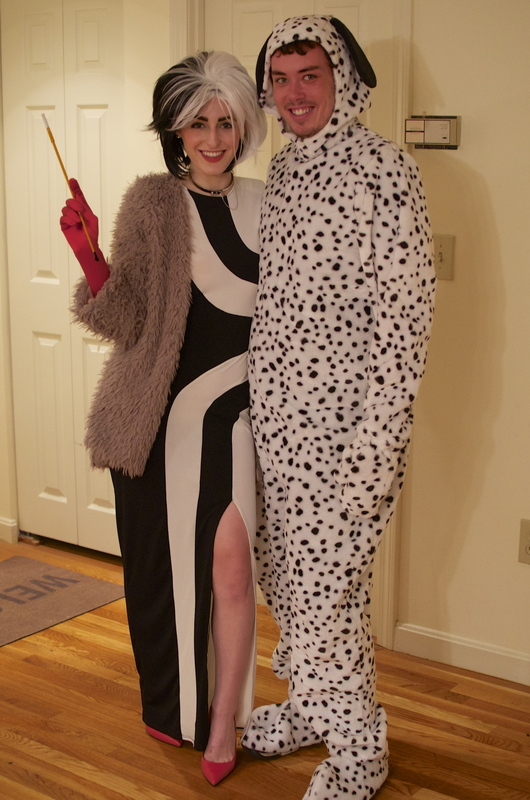 A significant other who loves you enough to wear a full dalmatian suit? That’s a little harder to find. I had so much fun paying tribute to Freddie Mercury…and developed a newfound respect for men with mustaches. Although I’m sad the festivities are over, Amanda and I are excited to get back to work! I have a lot of cool stuff coming your way, so stay tuned and stay saucy! 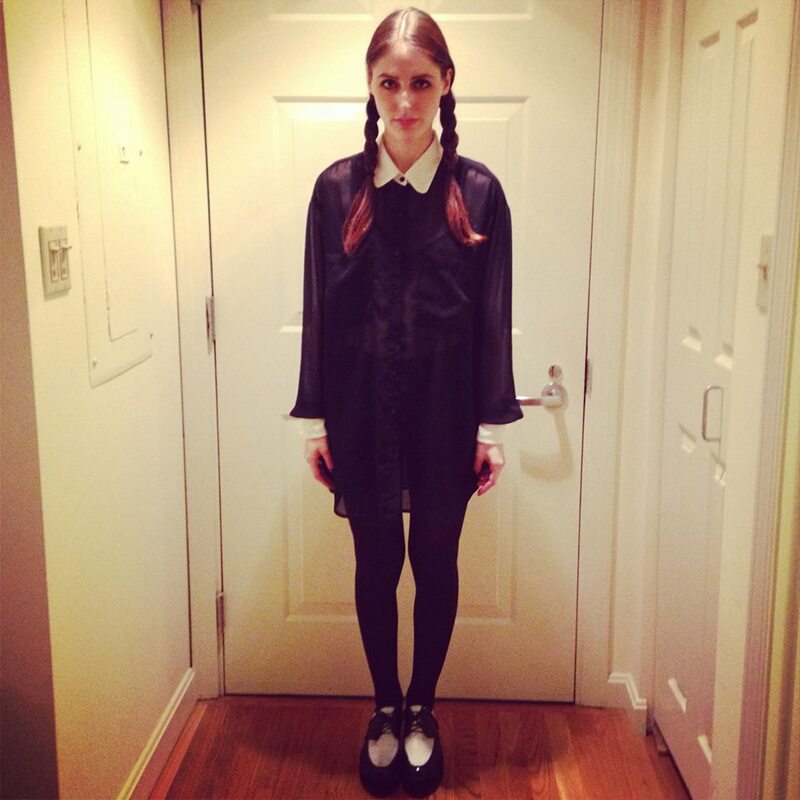 Shortly after I bought my Sandro creepers, it became clear that, being a pasty, dark-haired individual, I was born to dress up as one of my favorite spooky characters for Halloween: the ever so morbid Wednesday Addams. This oversized chiffon button-up from American Apparel (the third one you’ve seen me wear so far) with the contrast collar paid perfect homage to Wednesday’s iconic look. Two braids, some dark eyeshadow…done and done. 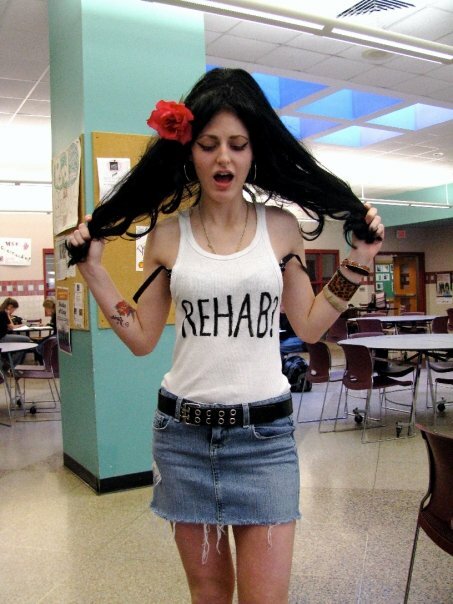 Let me start by saying Amy Winehouse is one of my favorite singer/songwriters of all time, and that I wore this costume in 2008, long before her death. (This picture was legitimately taken in my high school cafeteria.) Now let me say that, yes, the “Rehab?” wife beater I’m wearing says “NO, NO, NO” on the back. I got this incredibly realistic beehive wig on Ebay, and the floral hairpiece and many, many temporary tattoos are from your average party/costume store. Although the shirt is a reference to one of Amy’s most famous hits, and the woman was, admittedly, a hot mess at times, the fact remains that she had a beautiful presence and a strong sense of style. Sometimes I wish I’d worn something to reflect her passion for retro fashion and sweetheart necklines. 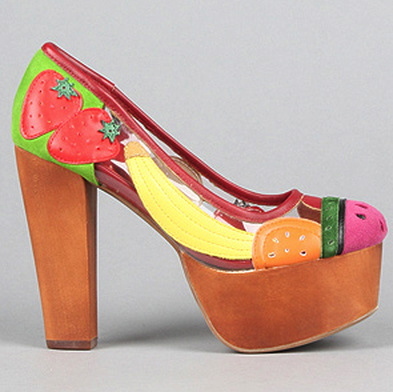 I had a Teenage Dream Halloween in 2011: I channelled Katy’s signature wacky style with my Lazy Oaf watermelon skirt, lacy bralette from LF Stores, and Jeffrey Campbell’s awesome Fruit Bowl shoes. You can get the purple wig at any traditional party/costume store, and the floral hair piece is from a stand in the Copley Place Mall. I used Makeup Forever Rouge Artist Intense Lipstick in “Satin Fuchsia,” and Essie’s “Turquoise & Caicos” and “Pink Parka” nail polish. 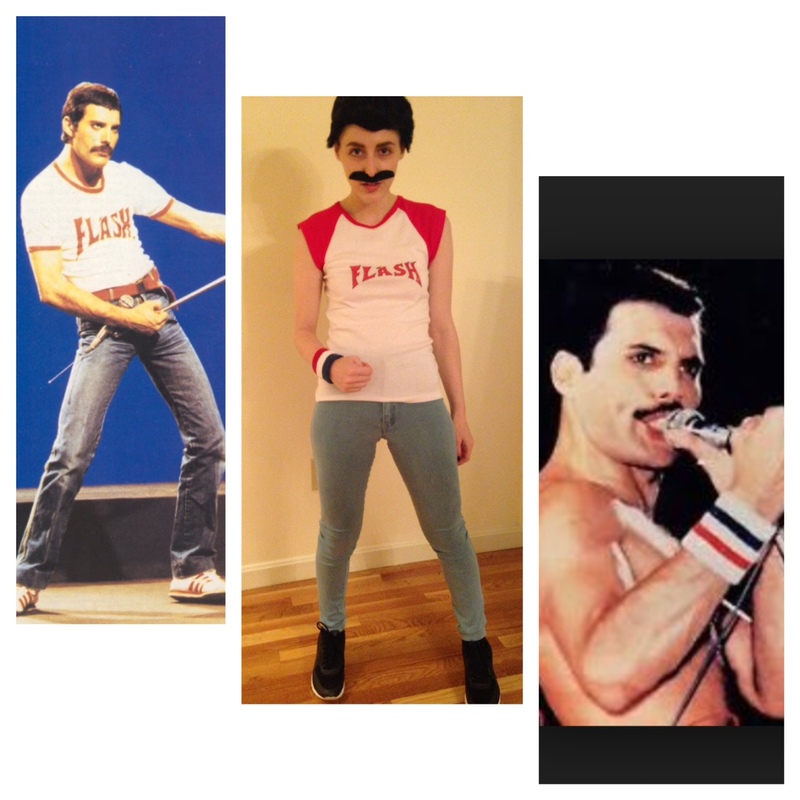 And yes, I have worn all of these items (apart from the wig) on occasions other than Halloween, thank you very much. I loved Pokemon as a kid—although now that I’m older, I realize the entire concept bears a striking resemblance to dog fighting…In any case, Pikachu is a cute and easy costume to put together. I got my yellow T-shirt and tights from American Apparel, and I already had these American Apparel high-waist corduroy shorts, which you’ll definitely see me in again pretty soon (—and not in costume). 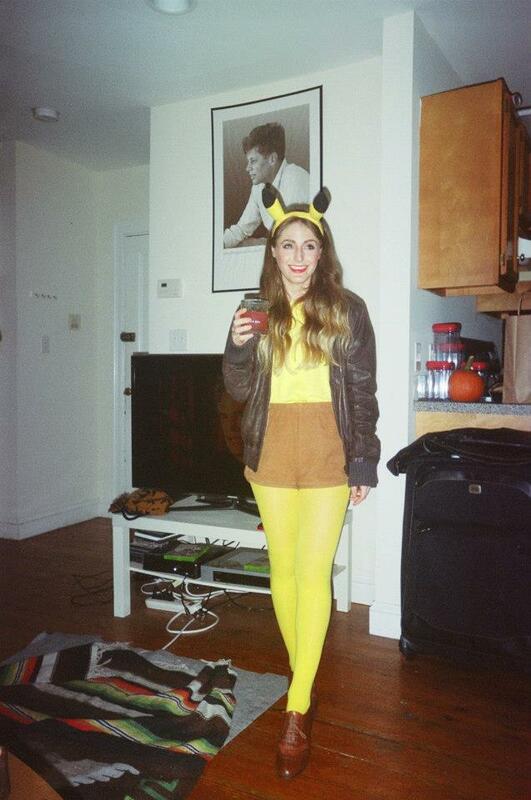 My leather bomber jacket and Miz Mooz oxfords are both from LF Stores, and you can just use Google or Amazon to find Pikachu’s ears and tail. YSL Rouge Pur Couture lipstick in “Le Orange” is the finishing touch. P.S. 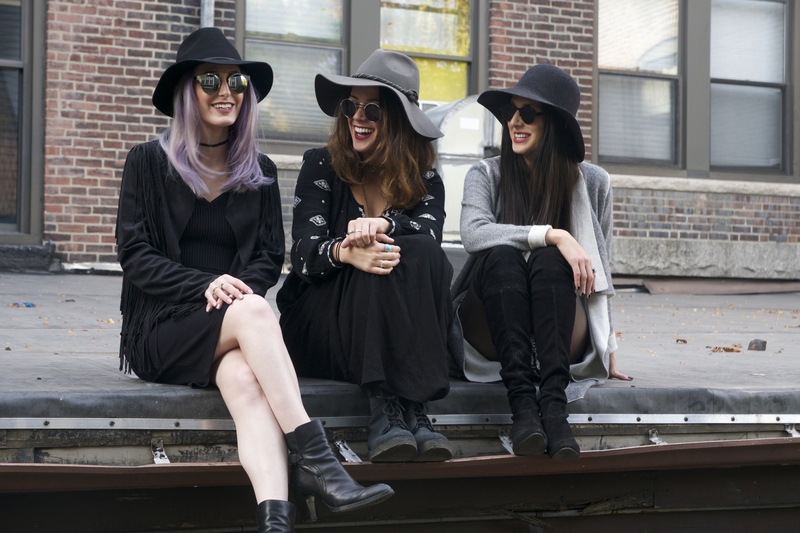 That’s the lipstick they use on the Nasty Gal models…for real!